The diameter of the rolling elements is specified here. For taper roller bearings, the diameter in the middle of the roller is used. 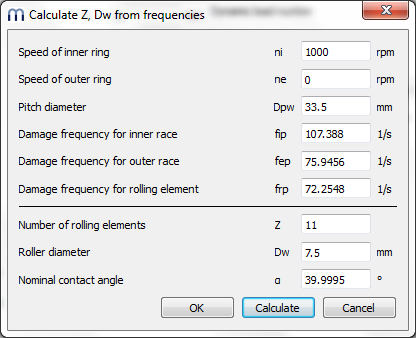 Using the -button, the number of rolling elements, roller diameter and contact angle can be calculated from given damage frequencies. This can be used if damage frequencies for a bearing are given and geometry data is missing.